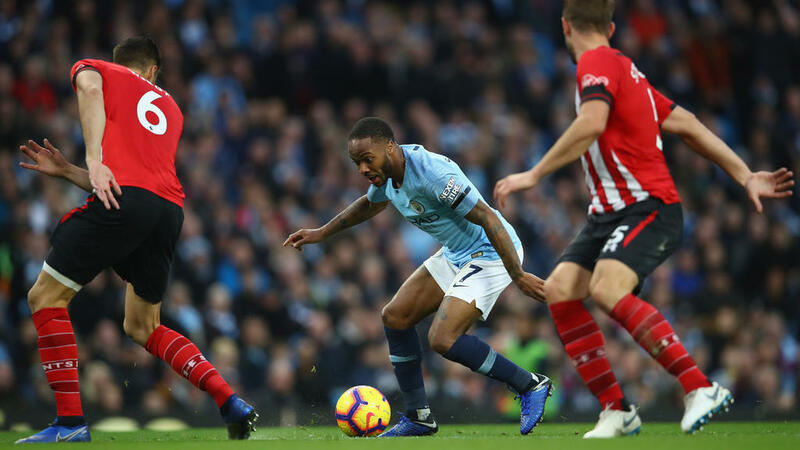 Raheem Sterling hopes to give Manchester City fans plenty more reason to chant his name after starring in Sunday's demolition of Southampton. Sterling scored two goals and provided two assists as City swatted aside Southampton 6-1 at the Etihad Stadium on Sunday. City manager Pep Guardiola praised the performance of the England attacker, talking about his "incredible form" as the crowd revelled in his performance. Sterling said he loved it when the crowd sang his name. "I've got to try to keep making them sing it," he said. "I enjoy playing at the Etihad any time. It is an amazing stadium, coming out here and seeing my family and everyone." Sterling's comments could be seen as a further sign of encouragement that he is close to agreeing a new contract with the defending champions, who are two points clear of Chelsea and Liverpool at the top of the Premier League. The former Liverpool player's current deal expires at the end of next season but there were reports last week that he had verbally agreed a new contract after months of talks. City face a tough week, hosting Shakhtar Donetsk in the Champions League on Wednesday before playing rivals Manchester United at home next Sunday. "They're going to be tough games," Sterling said. "It's a massive week ahead, starting with Shakhtar. That's the most important game. We need to try to win that and then go in to the derby." City were rampant against Saints and all but wrapped up the game inside the opening 18 minutes. Wesley Hoedt turned Leroy Sane's cross into his own net before Sergio Aguero tucked home his 150th Premier League goal and David Silva lashed in a third. Sterling struck twice either side of the break and then passed up a hat-trick chance by teeing up Sane's late sixth. "It was a great team performance," said Sterling. "The boys started really well and we were fantastic without the ball, not just with the ball. We needed to capitalise on Liverpool dropping points and I thought we were brilliant at times. "In football the hardest thing is to score goals and we have done that. We were ruthless and took our chances. That is what it is at this top level."